Little, Brown and Company, 9780316221900, 320pp. Recipes, tips, and strategies for easy, delicious vegan meals every day of the week, from America's bestselling vegan cookbook author. How does Isa Chandra Moskowitz make flavorful and satisfying vegan meals from scratch every day, often in 30 minutes or less? It's easy! In Isa Does It, the beloved cookbook author shares 150 new recipes to make weeknight cooking a snap. Mouthwatering recipes like Sweet Potato Red Curry with Rice and Purple Kale, Bistro Beet Burgers, and Summer Seitan Saute with Cilantro and Lime illustrate how simple and satisfying meat-free food can be. The recipes are supermarket friendly and respect how busy most readers are. 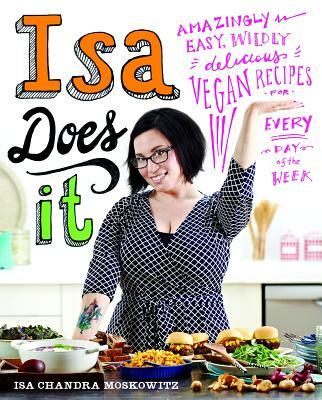 From skilled vegan chefs, to those new to the vegan pantry, or just cooks looking for some fresh ideas, Isa's unfussy recipes and quirky commentary will make everyone's time in the kitchen fun and productive. Isa Chandra Moskowitz is the best-selling author of the hit books Veganomicon: The Ultimate Vegan Cookbook, Vegan with a Vengeance, and many other titles. Her website, Post Punk Kitchen, is beloved by millions. Isa has been cooking up a vegan storm for over two decades and has been named favorite cookbook author in VegNews for seven years running. Raised in Brooklyn, New York, she now lives in Omaha, Nebraska.